Today, Franciscans everywhere are celebrating the Feast of the Church of St. Mary of the Angels of the Porziuncola (Little Portion). Actually, a small chapel, it is one of several chapels around Assisi, Italy, that St. Francis of Assisi repaired; shortly after his conversion. He was doing this in response to a mystical encounter with the Crucified Christ, who commanded Francis to “Repair My House!” Taking the command literally, he began to repair the chapel of San Damiano, and the other chapels. It was only later that he understood his mission was to “repair,” (ie, renew) the Catholic Church. 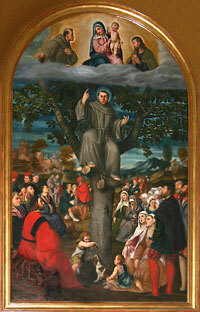 St. Mary of the Angels became the “mother church,” of the Franciscan Order, and indeed, the entire Franciscan movement. Francis and his first followers built huts of mud, straw and wattle around the chapel, and used them as cells. The little portion of land on which the chapel stood, belonged to the Benedictine monks of Mount Subasio, who have rented the site to the Franciscans, in return for a basket of fish. Over the years, the chapel became a pilgrimage destination, and eventually, the Franciscans and Pope ordered that the simple little chapel be enclosed in a huge grand basilica; the Papal Basilica of Saint Mary of the Angels. Today, the little chapel, located in this huge basilica, will be visited by Pope Francis. It ties into the Jubilee Year of Mercy, that the Pope declared last year. The little chapel is the site of one of the most famous indulgences granted by the Catholic Church. Although the historical fact has not been proven, legend has it that St. Francis asked the Pope to grant a plenary indulgence to anyone who came to the Porziuncola chapel, praying for forgiveness of their sins. An indulgence is granted to the soul of an individual, which remits some of the temporal “punishment”or “cleansing,” that a soul must go through in purgatory, before being admitted to the full beatific vision of God in heaven. A plenary indulgence grants a full remittance. The “Porziuncola Indulgence,” was originally granted only to those who visited the chapel, later Popes expanded it to those who visited a Franciscan church, chapel, or oratory. It was finally also granted to those who visited any church designated by the local bishop, between the afternoon of August 1, to sunset on August 2. They must at least recite the Our Father or the Creed; and must go to Confession, receive Communion, and pray for the intentions of the Pope. Indulgences is a means by which the Church illustrates the mercy and love of God for all people. And it is why Pope Francis is making the journey to Assisi, to go into a huge, ornate, basilica; to enter a very small chapel, that has the power of God’s love.